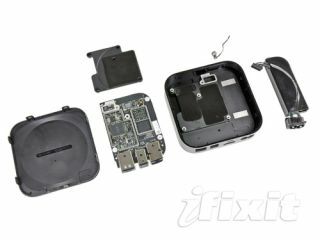 Apple's new streaming device, Apple TV, has been disassembled by the team at iFixit and there's some familiar technology powering the device. According to iFixit the Apple TV uses the same 256MB RAM which can be found in the 4th generation iPod and iPad and the same A4 processor as the iPad. It seems that Samsung are the ones behind Apple TV's 8GB storage (which can also be found in the iPad) which is pretty good considering the price of the device is far cheaper than that of an iPad. It is also interesting because the Apple TV isn't actually meant to have any memory, but it seems this means that this may be used for caching the shows that are being streamed. Other nuggets of information iFixit procured from its tear down include that the Wi-Fi board was made by Panasonic, and that there is a sticker rating on the inside which says: 3.4V @ 1.75A. Okay, maybe that is a little too much information, but it is great to see just what makes Apple TV tick.